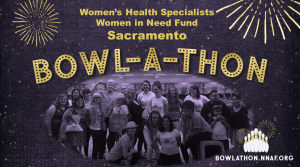 This weekend in Sacramento, we’re bowling to strike down barriers for abortion by raising money for our Women in Need fund. The Women in Need fund provides folks coming for abortion care with financial help for medical services, transportation, motels, childcare or whatever they need to be able to come to the clinic. Donate to help us reach our $4,000 Sacramento goal!! Drop-in and party with us! The bowling alley has a full restaurant and bar! Bring $20 in cash to bowl, plus $3 for shoes. There will be swag, plus prizes for top bowler and top fundraiser!